I expected the Imperials to be THE team of the 1950s after struggling behind the more talented Guardians in the first few yeras of the league. Instead, New York won three of the first four, and hasn't won one since. They are among the favorites going into this year, but the league is extremely top-heavy right now. Detroit and Houston are both incredibly talented as well, and the Guardians should still have enough of a window to be a threat, even if they had a poor season last year. Also interesting: teams wearing blue or purple as a their primary color have won 10 of the last 11 Victory Bowls. This is after winning only one between 1968 and 1978. 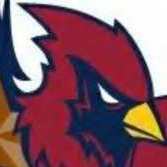 Teams wearing red as a primary color won 6 of the first 7 and 7 of the first 11, but haven't won one since. In fact, only three Victory Bowls since 1956 have been won by teams using red anywhere in their color scheme (Philadelphia in 1973 and Colorado in 1981 and 1983). So, is there a red curse? Finally, the late 1980s have been kind to teams with blades in their logos. Every championship since 1985 has been won by a team with a sword in their logo except for the 1986 Miners, who have a pickaxe. The trend could well continue, because (as mentioned above) Detroit and Cincinnati are contenders. Plus, would anybody be surprised if the Miners pulled one out of nowhere to send Krause out on top? The interesting thing is that the one step that they've taken to secure their future is actively groom Adams's eventual replacement. They took USC's Charlie Gardner in the 4th round of the 1989 draft. He has drawn comparisons to Reggie Hart (though that's probably just because they're both African-American former Trojans - Gardner lacks Hart's athleticism and precision, but has a stronger arm). Nobody outside of the organization has seen much out of him, but the team claims to be very happy with his progress so far. The problem is that their stadium is called the Coal Fields, which is a name as iconic as Mile High Stadium or Candlestick Park. It would have to be something like The Coal Fields at Krause Stadium, which is... meh. He's definitely getting a huge statue out front. On top of that, several teams that will be hosting the Miners this year have already announced that there will be on-field tributes to The Coach, including Boston and Philadelphia, who have been brutalized by him for decades (Boston owner Louie Peltier has said, half-jokingly, that theirs will be entitled, "We Hate to See You Leave, But We'd Hate to See You Stay Even More."). The organizers of the 45th Victory Bowl have also said that there will be a literal on-field nod to Krause, but they have declined to explain exactly what that means. I’m not sure what you’re trying to say. Three Rivers and Mile High carried those names until the days that they were demolished. The Mile High moniker even carried over to the new stadium. It would have been crazy to rename either one, just like it was crazy to rename Candlestick. Plus, the Comets are the franchise that sets/chases the latest trend. With teal and purple being big in OTL in the 90s, that is the logical next step for the Comets. I meant to say, if/when the Miners move out of the Coal Fields, Krause should be in the stadium name. Of COURSE Bubba's starting QB is literally named Liberty. I'm sure he was looking for players named Freedom too, but soon learned Freedom Williams is a musician, not a football player. I agree about the Coal Fields staying the same name. I can see the street it's on being renamed after him, but it would be like the Bears renaming or god forbid tearing down Soldier Field. As far as my Imperials, I'm a little hopeful of the next QB. It is great that he is able to learn under Adam's. I just really want Adam's to go out on top like Elway! Bringing back the argyle socks at some point would be a great tribute to Krause. But, that's just my two cents. Might have to wait until the 50th anniversary season when "The Original 11" wear their 1946-era uniforms. It will either be something like that, or if it's replaced, the new stadium would be called The New Coal Fields. Also, as @officerpain138 suggested, they will obviously rename the road that the stadium is on in his honor. Yeah, that is in the top 3 in terms of randomly generated names. The other two that have stuck with me are Doc Payne, who was on the original Philadelphia Continentals, and C.J. Random, whose surname was created when the Random Article button on Wikipedia took me to the page for random. That is exceptionally likely to happen. It'd be fun if they rename the street "Krause's' Way"
The 1990 season was, first and foremost, a farewell tour for Pittsburgh’s legendary head coach, Willie Krause. Krause, easily the greatest coach in the history of the game (and arguably the most iconic man in the history of American sports), entered the season with a career record of 396-196-20 over 41 seasons. To put that in perspective, no other coach has ever won 200 games, and a 12-win season would mean that Krause could end his career with 408 wins, matching the combined totals of Jimmy Bull, John Beaulieu, and Gus Koch, who are second through fourth on the all-time wins list. Even in rival cities like Boston and Philadelphia, where fans had been cursing his name since the Eisenhower Administration, the coach received thunderous standing ovations before and after each game. Unfortunately, the season was rough for the living legend, though he did break the 400-win mark in front of an enthusiastic home crowd in a week 12 rout of the New Orleans Krewe. Poor play on the road and a strong division saw the team quickly drop out of playoff contention, and with three weeks left in the season, the team sat at 5-8, leaving open the possibility that Krause could retire after the worst year of his career. However, after a players-only meeting in early December, the team rallied for their coach, stunning New York in week 15 (throwing the race for home field advantage into chaos in the process), crushing St. Louis on the road in week 16, and overcoming a 17-point second half deficit against Philadelphia in the finale to finish 8-8 and avoid handing Krause what would have been only the 8th losing season of his storied career. After the game, Krause gave an emotional speech, which left fans and players openly weeping. It took nearly two hours for the stadium to empty, as many remained in their seats, unwilling or unable to accept that the Willie Krause era had come to an end. The other theme of the 1990 season was redemption, as 5 of the 10 postseason berths were earned by teams who had missed out on playing in January the year before, including each of the top three seeds. The free agent-loaded New York Imperials entered the year as heavy favorites, and either held or were tied for first place through most of the season. Going into week 15, they were 12-1, two full games ahead of their closest competitors, with matchups at Pittsburgh (5-8), vs. Kansas City (7-6), and at Milwaukee (6-7), and had the top seed all but clinched. A surprise loss to Pittsburgh in week 13 weakened their grasp, and then a stunning 35-10 calamity against the Wolves in the season finale led to them squandering the chance to have the road to the title run through New York. Now with a poor December hanging over their heads, the team will enter the postseason with serious question marks. The league’s most competitive division was the North, as for only the second time in league history, every team produced a winning record in the same year. Much like New York, Cincinnati bounced back from a disappointing 1989 season, the Chicago Butchers improved from 4-12 to 9-7, while the Cleveland Ghosts and two-time defending champion Detroit Gladiators remained strong. All four teams were in playoff contention heading into the season finale, with Detroit hosting Cincinnati and Chicago traveling to Cleveland. Both games were thrillers – the Ghosts won 30-24 in overtime on a pick six by CB Kevin Rubin, earning a wildcard berth and eliminating the Butchers. Meanwhile, in Detroit, the Gladiators kicked a field goal to go up 27-23 with 1:21 to play, but Reggie Hart put together game-winning drive which ended with him diving for the pylon on a scramble as time expired. Over a chorus of boos from the Gladiator faithful, the officials signaled a touchdown, which sent the Guardians into the postseason with the number 1 seed while Detroit will host Cleveland in the wildcard round. 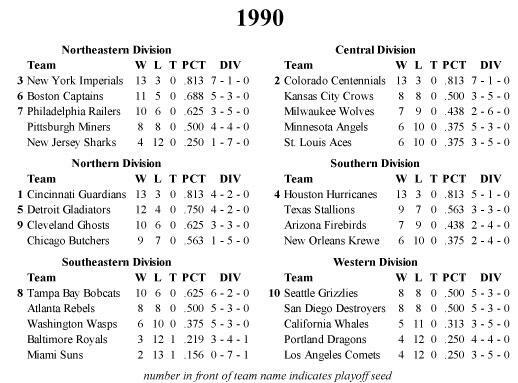 No team’s 1990 comeback was as complete as that of the Colorado Centennials, who inverted their 3-13 record in 1989 to go 13-3, while steamrolling their divisional rivals, earning the second seed. Houston similarly dominated the South as they have every year for the past half-decade. The Southeast was slightly more competitive in the early part of the season as the Tampa Bay Bobcats and Atlanta Rebels were neck and neck through midseason, but the Bobcats finished the year strong while the Rebels faded. Finally, there was the still astonishingly weak Western Division, whose five members averaged a dismal .363 winning percentage while going 9-31 against nondivisional opponents. The Seattle Grizzlies and San Diego Destroyers both managed to avoid a losing season by finishing 8-8, with Seattle earning the division title and the 10th seed on tiebreakers. Their prize? The chance to be humiliated on national television by Reggie Hart and the Guardians of Cincinnati. The remaining two wildcard slots both went to the Northeastern Division, as the 11-5 Boston Captains will head to the postseason for the third consecutive year, where they will go up against the 10-6 Philadelphia Railers who finally ended a playoff drought that has lasted since their Cinderella Victory Bowl run in 1973. The Gladiators have won back to back titles thanks to a great offense and a strong defense. Some of the key defensive players have shown their age over the past few months, but the offense is better than ever. Cleveland relies on the two-headed monster of running backs James McCoy and Jose Ortuno and a strong passing defense to win games. If the Ghosts are going to win, they need to claim the lead early, which will allow them to run out the clock with their rushing attack while also forcing Detroit into a one-dimensional gameplan. An upset here is possible, but everything would have to go right for the Ghosts. Detroit wins, 30-20. The Railers return to the postseason is a result of excellent play from a small core of star players, including 10th year QB John LeBell and sophomore sensation LB Tikani Oliver. Boston, on the other hand, are much deeper and better rounded. The big question of the day will be whether or not the Captains can protect QB Jon Cliffe, who is one of the league’s least mobile passers. Oliver in particular may create a problem, with speed, agility, and burst unlike anyone else in the league at his position. If Cliffe can’t stay upright, he’ll crumble under pressure, just as he did against Houston a year ago. Railers win, 21-17. Shame Krause couldn't get one last shot at the Victory Bowl. But hell, 6 decades of coaching, that really is a hell of an accomplishment. The Boston Captains glow in the dark, you can see them when you're driving. The Railers are going to run them over, that's what they'll do. What's the glowing in the dark thing about? Boston fans are actually getting kind of optimistic. No more Krause? Adams in the last year or two of his career? Philadelphia is looking pretty good, but QB John LeBell is in his 30s already. The Captains could be the bullies of the northeast within the next few years. They're a young team with a lot of room to improve. This was QB Nick Horsley's first full year as a starter, and the offense needs to mature, but they have potential. The defense is actually already pretty good. Part of their problem is the same as Boston's - they are in an absolutely brutal division. They're probably a .500 team in an average division, and they'd likely have competed for a playoff spot. That just isn't going to happen when you go 1-7 in your division.